Popped out to the states last weekend for Paula and Ben Herz’s wedding and what a lovely event it was. They looked so happy. While I was out there though visited Neal’s BBQ in Thomson, Georgia. 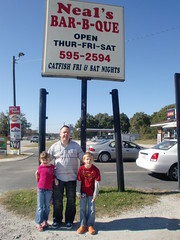 Now the reason that we took ourselves out there was because it had recently been featured on Jamies American Road Trip. It was the recent series from Jamie Oliver and he visited Neal’s on the show. It was the best BBQ that I had ever tasted. And Olivia our little girl went straight in and started talking to a couple of guys at a table which one of them turned out to be the owner. They were so hospitable and the prices are so reasonable – all children 8 and under eat for free and the main prices are about 7 dollars per plate. I had to try a bit of everything, so had the chicken, pork, ribs, beans, green beans, potato salad and a glass of tea. Oh and the lovely hash which was one of the things that Jamie helped make while he was there. It was delicious and will definitely go back. Completely recommend it and think the locals love it too as it was really really busy. Thanks guys for your hospitality it was great talking to y’all. Cant wait to come back and try your fish.